Electronics enthusiasts, developers and hobbyists searching for a super small ARM development board may be interested in Tomu which has launched via the Crowd Supply crowdfunding website this week and already raised over $13,000 thanks to over 263 pledges. Watch the promotional video below to learn more about the tiny ARM development board which is small enough to fit inside your USB connector. 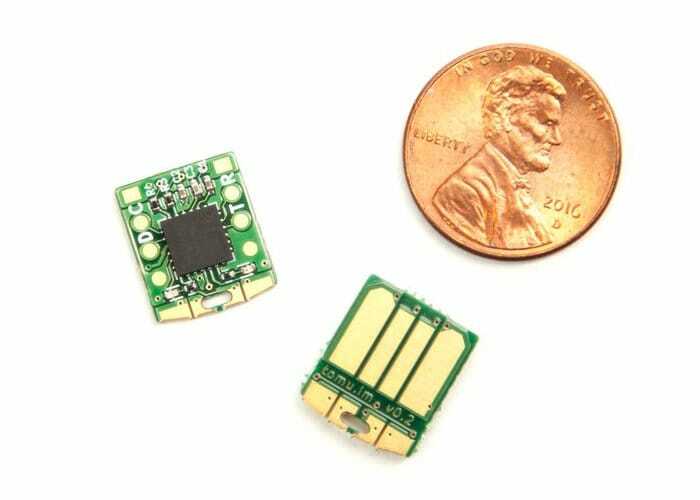 Powered by a Silicon Labs Happy Gecko EFM32HG309 processor offering speeds up to 25 MHz ARM Cortex-M0+ and supported by 8 KB of RAM and 64 KB Flash storage. The tiny development board also offers USB 2.0 FS connectivity as well as being fitted with two buttons and two LEDs offering red and green illumination. Tomu has been designed to provide a simple development board that is capable of hiding inside a spare USB port and requires no fancy set up or complex user interface to use. Tomu It is also open source and its hardware schematic seller available to download enabling you to make your own circuit board and expect how all the pieces slot together on the Tomu. Tomu Can also be used as a Universal 2nd Factor (U2F) token that are supported by many to factor authentication services to confirm the correct person is trying to access data or accounts online. U2F simplifies The authentication process which normally requires messages to be sent and codes to be entered. Tomu Can verify your identity by the simple press of a button, with U2F software loaded, Tomu can act as that token. The more specifications and details on the Tomu jump over to the official crowdfunding webpage by following the link below.